Summary: In the last few years, sea turtle researchers have paid great interest to stable isotope analysis because stable isotopes can be used as intrinsic markers to trace foraging habits and migratory connections. To apply this technique successfully, it is important to understand (1) how stable isotopes change between diet and tissues of interest (i.e. discrimination factors) and (2) what the element-turnover rates are in metabolically active tissues (i.e. turnover rates). The latter is particularly interesting because differences in incorporation rates among tissues may allow constructing an “isotopic clock” to date the time of a diet shift. There is a paucity of controlled laboratory studies on differences in isotopic incorporation, elemental tissue turnover rates and discrimination factors among tissues in marine vertebrates, even though knowledge of the patterns of stable isotope incorporation into body tissues of wildlife species is required to interpret field data correctly. With regard to sea turtles, no study has determined diet-tissue discrimination factors and tissue turnover rates in adult loggerheads. We will conduct a laboratory diet-shift study with captive sub-adult and adult loggerheads to determine (1) discrimination factors and (2) turnover rates of tissues that are commonly sampled non-invasively (blood, skin, scute) by sea turtle researchers. This research will provide data to correctly interpret the several studies that are using stable isotope analysis to infer foraging ecology, migration and connectivity of wild sub-adult and adult loggerheads. Knowledge of habitats and diets of adult females and large sub-adults is essential for the management of the Florida loggerhead population, which has seen a 25% decline in nest numbers since 1998. Results: Phase 1: Acclimation period -All loggerheads (n=7) were maintained on a constant diet in order to allow the tissues of interest (blood, skin and scute) to equilibrate to the control diet (Diet A). Diet A mimicked the loggerheads previous diet, and was comprised of squid, capelin, mackerel and clams. We measured the carbon and nitrogen isotopic signatures of each food item and determined proportions of those 4 food items to be kept constant (75% mackerel, 13% capelin, 4.5% squid and 7.5% clams) for the length of the acclimation period. In order to decrease natural isotopic variation among food items, SeaWorld purchased the food required to feed the loggerheads for 1 year in a unique batch. Food was stored in a frozen state in the Park cold room. We could not purchase food for the entire length of the study (27 months) in a unique batch due to concerns that nutritional properties and diet quality would be affected by such a long storage. 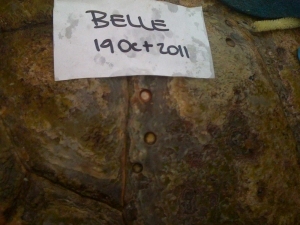 Loggerheads were maintained on the acclimation diet from January 2011 to the end of March 2012. We collected tissue samples (blood, skin and scute biopsy) on 12 occasions from all seven loggerheads during the acclimation phase. We collected 20 diet items (5 sample/food items) at each sampling event to examine within batch isotopic variability in the diet. Phase 2: Experimental period - Our experimental design changed when SeaWorld opened a new exhibit (Turtle Trek) and intended to move Dandi, Divit and Belle (the three individuals that were in the public exhibit) into the new exhibit at the end of March 2012. In March 2012 we received the new batch of food for the remaining year of the study. At the end of March 2012, we started the experimental phase and changed the diet of the five loggerheads (all but Belle and Grandma) in the experimental group by replacing mackerel with blue runner. Dandi and Divit (which were “the stars” of the study) were moved from the original public exhibit into a large quarantined tank off display and then into Turtle Trek. Both turtles stopped eating (for a couple of months), a behavior perhaps related to stress associated with all the movements between tanks. Dandi and Divit stayed in Turtle Trek only for a few days and went back to the big quarantined tank but did not resume eating for several weeks. The other turtles in the experimental group (Willie, Lil Herc and Cobbler) ate mostly as expected. We continued sampling both turtles and food items as scheduled. The experiment ended on March 2013. The end of the experiment was dictated by the need of SeaWorld to move forward with their plans regarding the Turtle Trek exhibit. SeaWorld was extremely supportive of the study: they accommodated our requests and allowed us to continue the study as long as possible.